Did Madoff's biggest 'victims' get 950 percent returns? 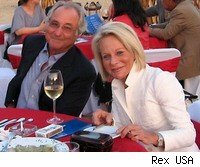 Last December when Bernie Madoff gave up on his $64.8 billion Ponzi scheme, I guessed that he had help. He could not have produced the fake statements on all those accounts by himself. But in a twist that I had not thought of back then, a lawsuit now alleges that Madoff's biggest clients were in on the scheme. That's especially surprising, given that some of the names mentioned have been touted as Madoff's biggest losers. Here's how the lawsuit suggests that Madoff's clients helped him with his scheme: The clients told Madoff how much of a return they wanted in a given year. Madoff would manufacture the fake account statements needed to generate those returns -- word of which would reach hundreds of other investors who would then clamor to give their money to Madoff, who in turn would forward that new money to his prized clients so they would, indeed, get those high returns. How high? Well above the 10 percent to 12 percent annual returns that have previously been mentioned in coverage of the story. According to a lawsuit by Irving Picard, an attorney at Baker & Hostetler LLP who is trustee in the bankruptcy liquidation of Madoff's firm, several of Madoff's investors received returns in the range of 300 to 950 percent. Among those investors Picard alleges was Jeffry Picower, a lawyer, accountant and buyout investor. Picower's foundation invested with Madoff, at one point stating its investment portfolio was valued at nearly $1 billion. He and his wife, Barbara, had 24 accounts with Madoff and received annual returns of more than 100 percent in 14 instances, reaching as high as that astounding 950 percent, according to Picard. Picower's lawyer disputes these claims. He says his client was shocked by Madoff's fraud and his foundation has lost billions. Who knows which of these claims is true? It's entirely possible that Madoff kept up the 950 percent returns for his earliest investors as long as new money kept flowing in. With the market collapse in 2008, he then would have shifted into triage mode, moving whatever remaining cash he could find to his family and leaving those early co-conspirators or enablers on the wrong side of his dirty dealing. But realistically, our government was also a co-conspirator in Madoff's scheme. That's because we allow managers like Madoff and Enron's Jeffrey Skilling to write their own report cards. And if Madoff had not been able to create fake account statements, his scam would never have gotten off the ground. As I've posted, there is one sure way to prevent such scams in the future -- stop letting managers write their own report cards.